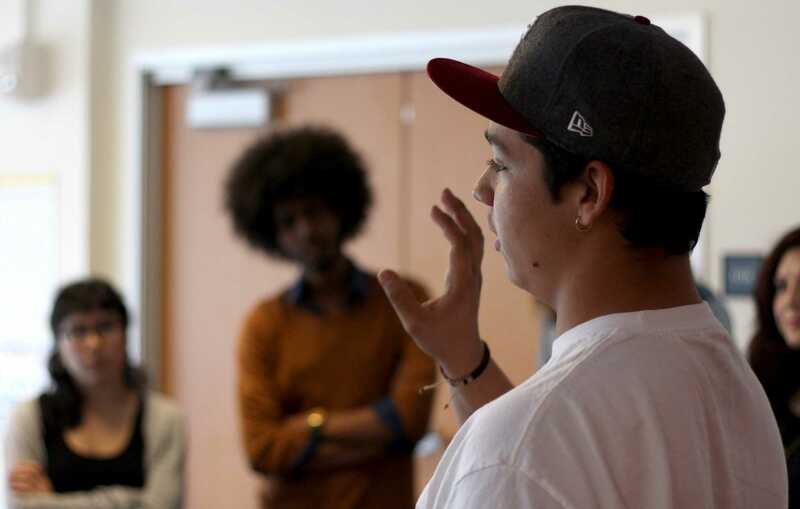 Ahkeel Mestayer (front right) participates in an exercise during the “Feminism for Bros” event at J. Paul Leonard Library in San Francisco, Calif. on Wednesday, Oct. 15, 2014. Henry Perez/Xpress. A discussion-based workshop titled “Feminism For Bros” invited all genders to redefine what it means to be a feminist and joined the gender inequity conversation at SF State yesterday. Jamal and co-host Rachel Newsome of the Student Union of San Francisco said modern feminism is considered a controversial term, often associated with hating men. The hosts’ goal was to get males, or “bros”, involved in the discourse too, and prove that all types of people can be feminists. The workshop focused on multiple gender perspectives and created a safe space for men and women to talk about what feminism means to them. Members of the group shared personal stories and experiences as they considered different definitions of equity, equality, power and privilege. One attendant, Tom Relling, was inspired by his girlfriend to join the workshop and learn more about feminism. The event ended with a game that invited participants to stand on either side of a line on the ground depending on their response to yes and no questions. The last question, “Do you consider yourself a feminist?” brought all members of the group to the ‘yes‘ side. 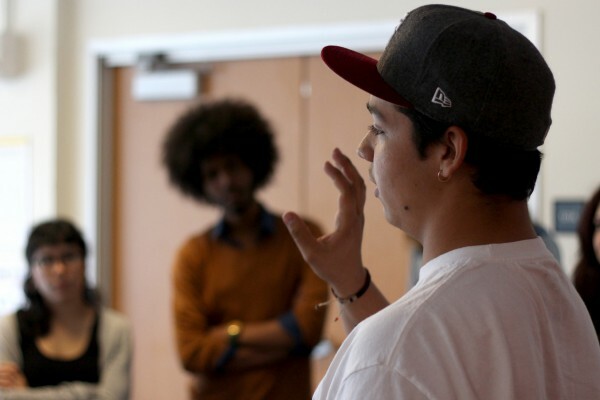 Yesterday’s workshop is a part of the series of teach-ins hosted this month by the Student Union of San Francisco. Jamal and Newsome hoped to provide people with discussion tools so they can continue the conversation in the community. Ms Newsome, we don’t think it we know it and here the proof. This is a feminist laughing at male suicide at a lecture talking about men’s issues. When this feminist cretin was called out for her deplorable actions, feminist organizations and media held her up as some sort of hero. I feel sorry for those misguided individuals who fell for ‘feminism’ is inclusive crap as I did many years ago. However I woke up to the feminist lie about 6 years ago and have exposed its lies ever since.